Heat oven to 375°F. In large bowl, combine sugar and 1 cup margarine; beat until light and fluffy. Add sour cream and eggs; blend well. Add all remaining cookie ingredients; mix well. Drop dough by rounded tablespoonfuls onto ungreased cookie sheets. Bake at 375°F. for 8 to 11 minutes or until edges are light golden brown. Immediately remove from cookie sheets. Meanwhile, in small bowl, blend all frosting ingredients until smooth, adding enough orange juice for desired spreading consistency. Frost warm cookies. 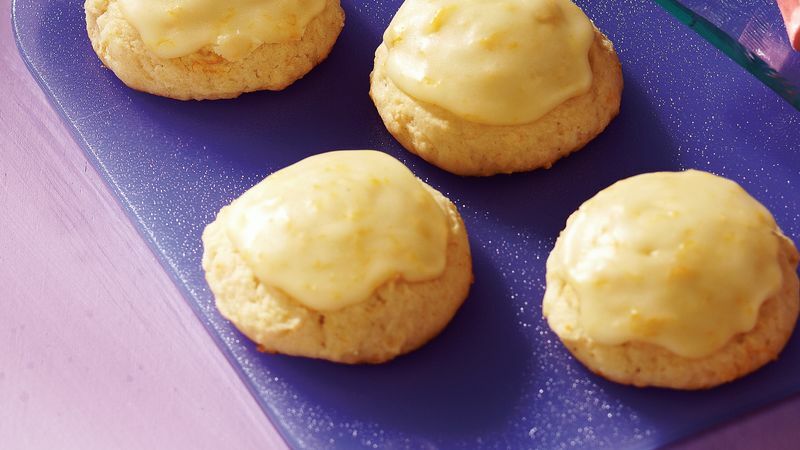 Packed with citrusy orange peel and orange juice, these fresh orange cookies are the real deal. This recipe yields a whopping 72 servings, which means you can get all your favorite citrus flavor and then some! A little zest goes a long way—grating the orange peel releases concentrated oils that are in the fruit’s skin, so having a few tablespoons in the dough and even more in the frosting will give you some serious orange flavor. Use a microplane grater, box grater or vegetable peeler to grate the peel easily. Making cookies from scratch for the first time? We’ve got the tips and tricks to make your new favorite cookie. Or, you can browse our many cookie recipes for inspiration.